Jaco Aerospace has been providing high quality chemicals, raw materials and consumables to the commercial airline and aerospace industry. As an authorized distributor for a host of internationally recognized manufacturers, we have close to 40 years of distribution experience, and provide immediate delivery of quality factory new products to customers. Our facility is specially designed to meet the individual needs of our customers. 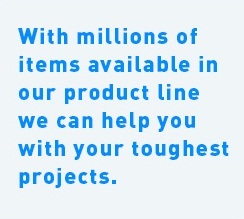 You can be sure of finding the products you need and the service you expect. Special treatment for all our customers is routine - it's the way we do business. We routinely go beyond the ordinary to fulfill the special needs of our customers. We attribute our growth to the reliance our customers place upon our people. Our management has always believed that expanding operations can only be serviced with talented people. We combine the newest business techniques and technologies with the "tried and true" values of personal service. We have a unique blend of talented people; experienced salespeople; knowledgeable customer service; and a friendly, helpful staff. The founding premise of excellent service and quality materials at competitive pricing is the cornerstone of our growth. Our expanding family of affiliated companies includes United Airlines, Southwest Airlines, Delta Airlines, Northwest Airlines, British Airways, Honeywell, Continental Airlines, Lockheed Martin, Gulfstream and Boeing. We see the future as a period of dramatic change. Meeting the challenges of this unfolding era will require a blend of new world thinking integrated with old world values of quality and integrity. The world will continue on a course of change. Jaco Aerospace and the people we represent, look ahead to meeting the challenges these transitions will bring. Our ultimate goal is to better serve our customers. We maintain only the highest quality OEM products in our large warehouse. Our inventory includes such items as lock wire, hand tools, tapes, tubing, gloves, paint supplies, barrier papers, cleaners, cordage, packaging materials, plastic laminates, sheeting and bags, etc. Jaco Aerospace is conveniently located 20 miles east of downtown Los Angeles. Offices and warehouses are located at: 2075 N. Fair Oaks Ave. Pasadena, CA 91103. Jaco Aerospace is a sister company to ElJet a leading private jet charter services company.